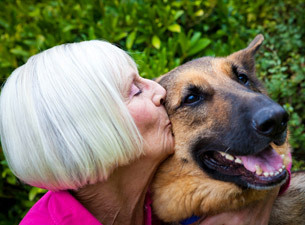 There are a variety of great health benefits that come with owning a pet. Whether you prefer the furry or scaly types, animal friendship has been shown to improve people’s lives in a number of ways. Many of these benefits are particularly useful to individuals who either get their first pet or continue pet ownership after retirement. Improved Socialization: Owning a pet, particularly a dog, is great for starting conversations. Often, people will ask questions about your pup including its name, breed, age, and where you got it from. They will want to pet it and watch any tricks it may be able to do. From this initial conversation about the dog, you may be able to develop a friendship or at least an acquaintance. This can help you come out of your shell, and the comfort of your pet beside you can help reduce some social anxiety you may have. Reduces Stress: Being greeted by a furry friend who is happy to see you after a hard day is a great way to reduce stress, as it is nearly impossible to still be upset with an excited pet enthusiastically waiting for attention. Spending time with your pet and cuddling them releases a chemical in your brain called oxytocin, which produces a soothing, calming feeling and increases the bond between you and your pet. Having an animal companion has also been shown to reduce the levels of cortisol, a hormone produced as a response to stress. When there is an excess of cortisol in your body, it can cause irritability, hypertension, and high blood sugar levels. More Exercise: Many times, you may find yourself not wanting to exercise. When you are a dog owner, it is no longer an option and instead becomes a necessity. Not only does your pup need to go outside to take care of business, but it also needs to stretch its legs and get some exercise of its own. Companionship: If you live on your own, having an animal around the house can help make your home feel fuller and bring life to the space. They also give you someone to talk to, spend time with, and do things with, such as going for a car ride or visiting friends. Pets often end up feeling like part of the family over time and alleviate loneliness. Relieves Depression: Playing with or stroking a pet can raise the levels of serotonin and dopamine your body produces. These increased levels make you feel happy, relaxed, and calm. The responsibility of caring for another being helps bring a sense of purpose back into your life when you may occasionally feel you have none. 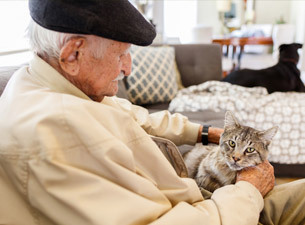 At The Holiday retirement communities, we have regular pet visits for our residents and we welcome personal pets in our units, provided they can be cared for and are appropriate for the building. We offer a healthy lifestyle by proving a wide variety of nutritional meal choices as well as an onsite Dietician to promote healthy living and a fit lifestyle. There are many activities, and programs offered as well as regular outdoor events and excursions to enable seniors to live their life to the fullest and enjoy themselves. Here at The Holiday, we provide many different options to help keep our residents engaged, active, and happy. We take care of each one of our residents like they are our own family.